Like the structure of a great song, there are all sorts of compelling supporting components that let the journey ebb and flow then crescendo towards the all-important main chorus at SoMa’s high-end seasonal California meets Pacific Northwest newcomer, Birdsong. The menu (the lyrics) is somewhat inspired by our neighbors to the north along the Pacific Coast, somewhat inspired by our local terroir, and heavily inspired by the chef’s highly impressive World’s 50 Best and Michelin star-filled fine dining background. 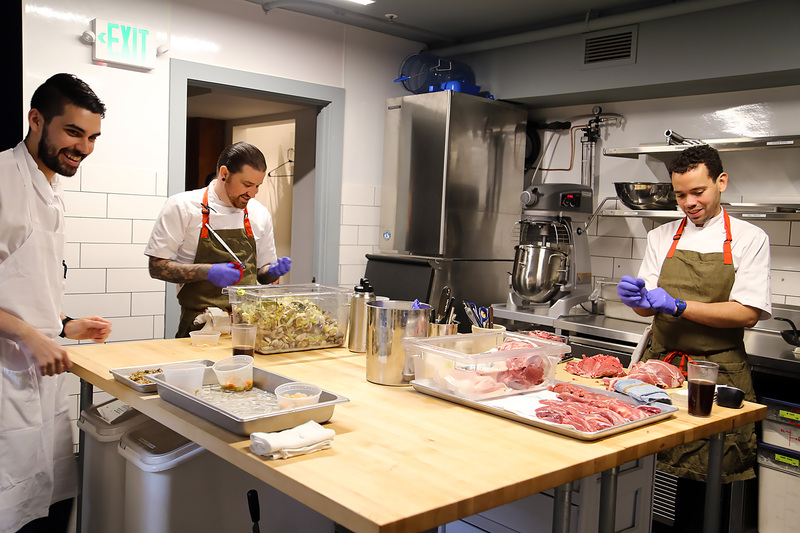 The restaurant is springing for a duel tasting menu and à la carte format (the rhythm) that can be pulled off, but sure is daunting for the kitchen to do. The breathtakingly gorgeous space (the background harmonies) could be a living room set-up for a cover spread in a chic magazine like Monocle. The Mid-Market/SoMa border location at this particular place and time (the tempo) in San Francisco is pretty much front and center for everything that is being debated by this year’s mayoral candidates, and has a history of being unfriendly to friendly restaurants. 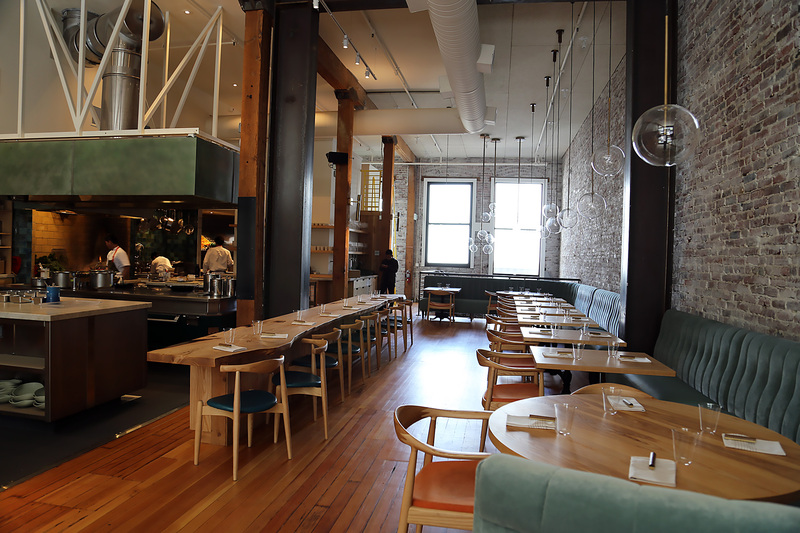 And all of these storylines build towards the chorus — the heart of why Birdsong has been one of the most anticipated restaurant openings in the city for months and is here for diners to venture to Mission Street to experience firsthand. No, Birdsong isn’t about tail-to-beak whole poultry cooking, a Grateful Dead song, a mid-20th century British novel, or somebody’s deep involvement with the Audubon Society. Birdsong is a pleasant reference to the beauty of nature and how birds help ecosystems grow and stay healthy, setting a mentality for diners as they step into a restaurant that wants to slow down cooking and bring it back to its roaring fire and pristine ingredients past. That background sets the stage for the true reason (the chorus) of why Birdsong is a pivotal restaurant for the Bay Area and national restaurant watchers to know about: it’s the solo debut of one of the (or possibly THE) most under-the-radar, ready for the bright lights chefs in California. Chances are you don’t know Chris Bleidorn. But it’s very likely you know a lot of the stops on his resume. Alinea. Benu. Saison. Atelier Crenn. Johnson and Wales. This isn’t meant to be a LinkedIn entry for the chef but it’s vital to mention this because Bleidorn clearly has the background to make an impact straight out of the gates with Birdsong. It’s the culinary equivalent of a B.A. at Stanford, a Rhodes Scholar at Oxford and a Ph.D from Harvard. He’s ready for prime time and the Bay Area’s dining scene is ready for him. So, we’ll have to wait a little longer to find out what those à la carte dishes look like. For now, though, we definitely have a good sense of his cooking style that shows subtle influences from his prior stints at those aforementioned influential kitchens but really has its own distinct, gentle voice. Bleidorn currently leads off with a series of snacks that definitely give that impactful punch in one-to-two bites. 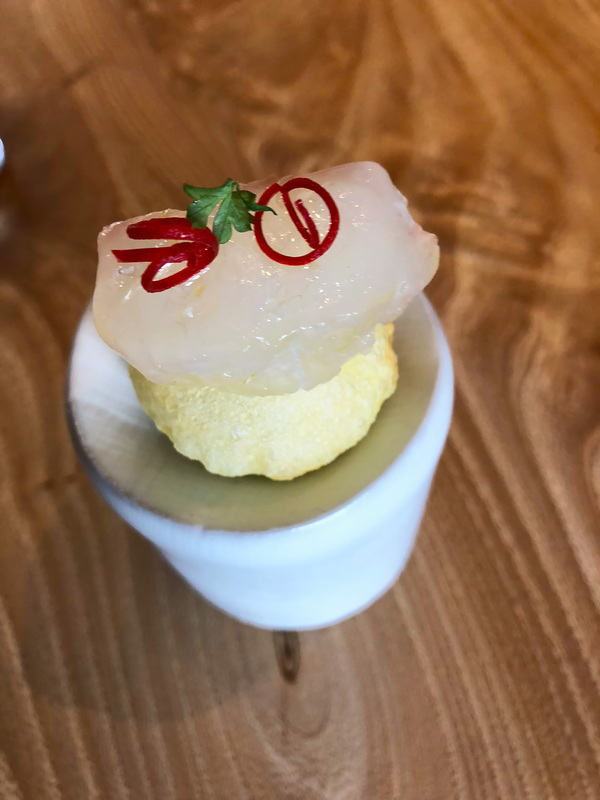 First comes a ceviche-like edible still-life of tiny Pacific scallop from Washington state with its own salted liver, nestled into a glass dish with apricot vinegar, Douglas fir oil and ice plant. Then diners move onto what is sure to be a menu staple for it elegantly abstract take on a pub grub classic: fish and chips. There are no mushy peas here nor is there greasy batter-fried fish. Instead, imagine if Jiro the celebrated Tokyo sushi chef did a pop-up in Dublin. A glistening slab of halibut is served atop a puffy pomme soufflé (similar to the gol guppa street snacks of India) with tartar sauce. 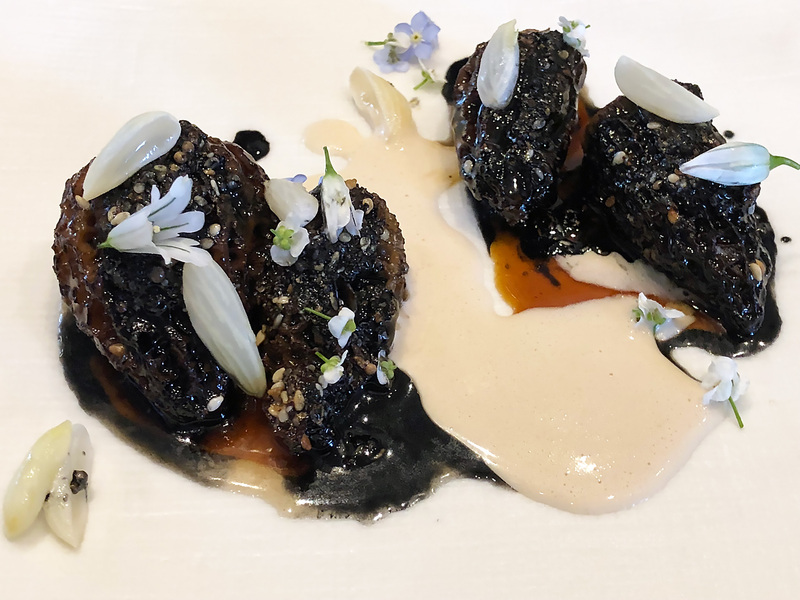 More and more tasting menu destinations are becoming fans of taking a common central ingredient and presenting several diminutive bites that show that ingredient in completely different versions. 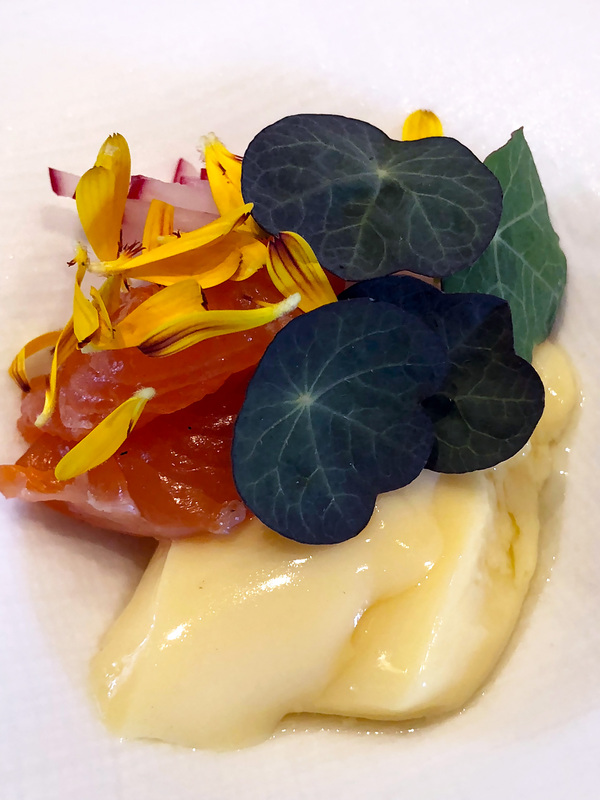 Matthew Kammerer, another former Saison chef and now Executive Chef at the spectacular Harbor House Inn in Elk (Mendocino County) takes this to another level by providing preview canapés made of the meal’s featured produce before diners even officially start the meal. Bleidorn doesn’t quite go that far but he does serve a trio of creek-raised trout tastes served simultaneously. 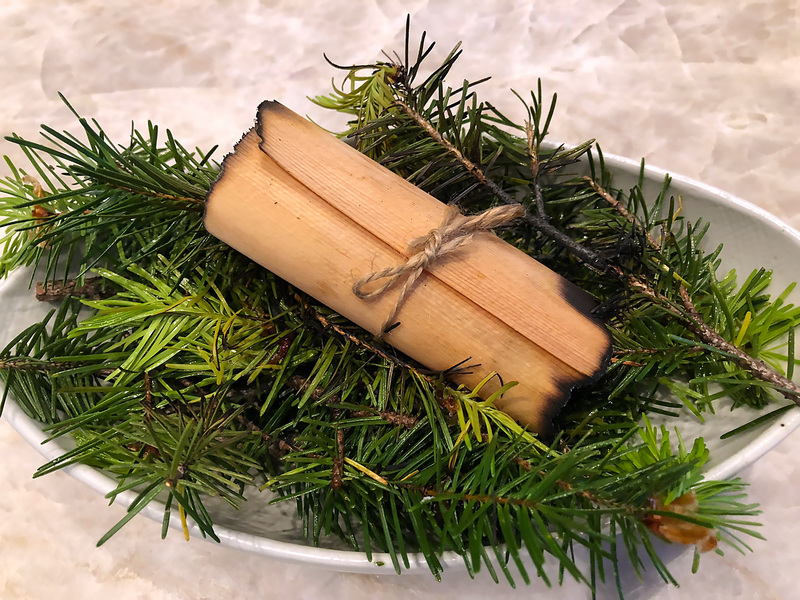 Cured trout is warmed and smoked in cedar, and hidden in a cedar package for serving at the table with a Douglas fir branch flourish. Trout roe comes as a sandwich with a mayonnaise-like creation accented by sour grasses and horseradish. What’s the bread for this two-bite spicy-briny flavor rush? You got it — crispy trout skin. The trout treats trio concludes with an ensemble of belly meat scraped off the bones, a custard then made from the dried trout bones, and salted mustard leaves and stems. Is that enough trout for you? We haven’t seen the eyes, tail or cheeks used yet, but we’re not doubting that those are on the horizon to fully utilize the fish as is so central to Birdsong’s mission. 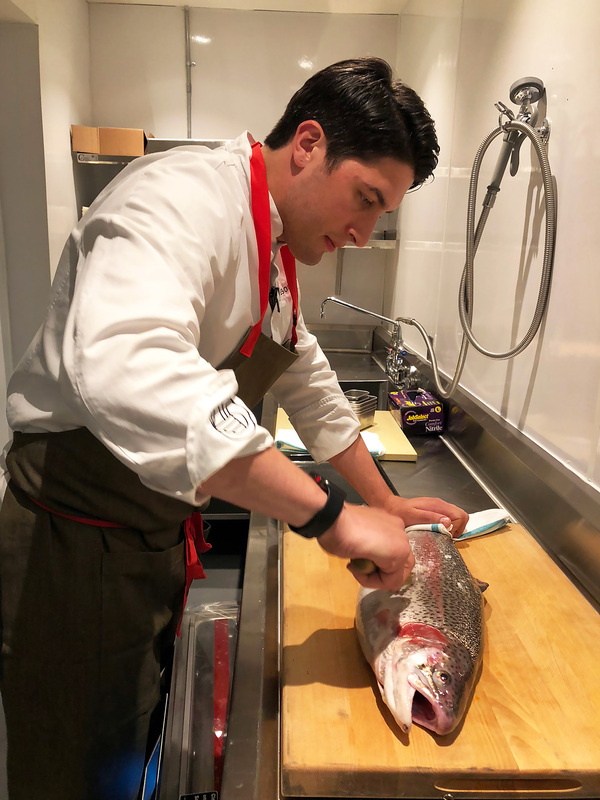 Chef de cuisine Brian Limoges (previously at Quince and Atelier Crenn) showed us how to cut into one of the large trout they had just received and admitted that they’re still figuring out a way to use the fish’s guts. Hey, maybe it will turn out to be a delicacy and be an aquatic version of sweetbreads? 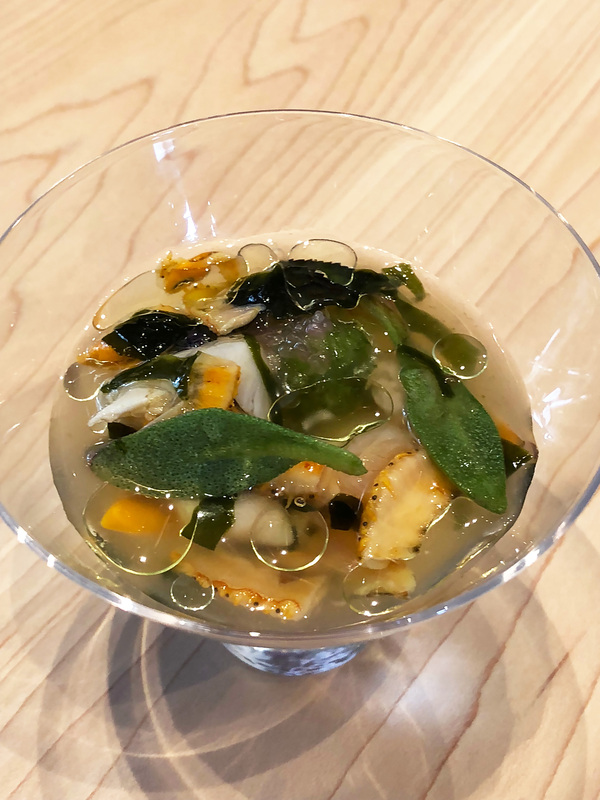 The water motif continues in the next course with Washington state geoduck clams joined by lardo, celery and smoked potatoes in a bowl, then tied together by a complex clam and buttermilk whey broth poured tableside. If this sounds like an abstract San Juan Islands clam chowder, you’re not imagining things. Bleidorn is from Hingham, Massachusetts (along the Atlantic between Boston and Plymouth) and this dish is obviously a nod to his home state. And, if you’re wondering, yes he is still a passionate fan of the Red Sox and Patriots — Boston teams and a love of chowdah never leave New England natives even when they’re on the West Coast. Cedar, halibut, geoduck clams...are you sensing a theme? It probably doesn’t occur to you at first because Bleidorn doesn’t hit diners over the head with a relentless focus on the Alaska-Oregon-Washington-British Columbia theme. 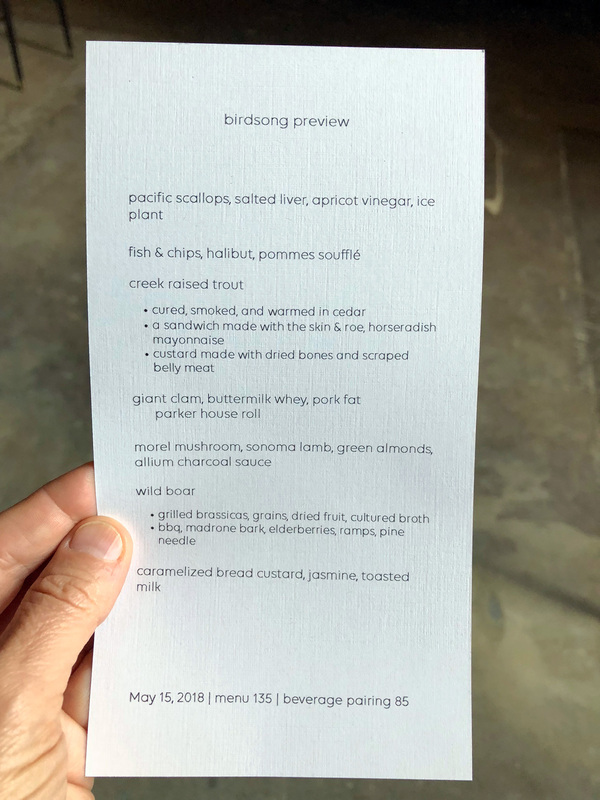 Much of the pre-opening press has centered on Birdsong being a “Pacific Northwest” restaurant, which is semi-correct and semi-incorrect. The Bay Area has only seen one Pacific Northwest cuisine in recent memory, Café Eugene in Albany. It lasted two years and never really found its stride being “Pacific Northwest” focused. Though we see New England, Southern, Texan and New York-inspired restaurants open all the time, Bay Area diners seemed puzzled by a Pacific Northwest concept in the East Bay — despite the fact that some of the best restaurants and raw ingredients in the country can be found in Seattle, Portland, Oregon, and across that rain and forest-filled region. Bleidorn didn’t choose the Pacific Northwest for the sake of being different or because he absolutely loves watching “Portlandia” or climbing Mount Rainier. He didn’t do a lot of on-the-ground research other than a few days of tasting around Alaska. To him, the region is “The New England of the West Coast” in terms of an unwavering respect for seasonal ingredients (we’re pretty sure that’s the definition of Californian cuisine, right?) and a magnificent terrain composed of breathtaking mountains, streams, oceans and forests. After all, both regions have a Portland. We could go on all day about geoduck clams and Ipswich clams; Bend and Sugarloaf; Seahawks and Patriots; Mount Rainier and Mount Washington; Alaskan halibut and Maine lobster; and whether these comparisons are truly similar or different. What Bleindorn really means by their similarity, beyond being northern corners of the country, is that both have a strong sense of place and they do indeed have a lot of shared natural traits. Both areas can be considered the New World equivalent of Scandinavia — austere in winter, magnificent in summer, but always home to a dramatic natural ecosystem that leans heavily towards the sea and mist-filled forests. So, Wisconsin doesn’t fit here. We shouldn’t feel compelled to put strict labels on any talented chef’s cuisine but the best way to think of what Bleidorn is doing is “West Coast” because we are in California, after all, and something like “rustic, nature-minded and advanced technique” because you can see the high-level methods that Alinea and Benu might incorporate into plates but there’s also a low and slow, whole animal and produce mindset that is a trend stemming from a range of concepts from Chez Panisse to Texas BBQ to New England clambakes. 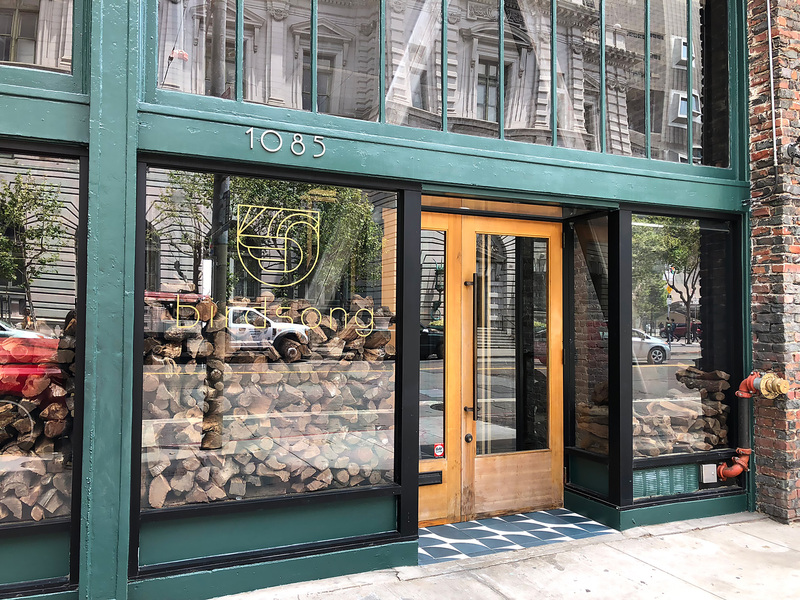 Outside of Saison and now, Avery, we haven’t seen much of that rugged “rustic and nature-minded” mentality creep into the intricate tasting menu sphere. Add Birdsong to that burgeoning group. Birdsong uses big “once upon a time” buzzwords like “ancient cooking” and “heritage cooking” to describe this not very describable cuisine. Those terms make Birdsong sound like the restaurant is cooking wooly mammoth over driftwood with a backdrop of enormous glaciers. The most apt description comes from a quote by nature writer Michael Frome that Bleidorn likes to refer to: “Each succeeding generation accepts less and less of the real thing because it has no way of understanding what has been lost.” This is true in the history of food and across the board for society whether you want to rail about dating apps, smart phones, Teslas, chain stores, and pretty much everything Silicon Valley is trying to disrupt in every cultural space. For Bleidorn, the key is “to slow down the watered down approach” that has crept into the kitchen and much of life. But, he’ll also point out that it’s not the fault of chefs — this is how society evolves. It’s just that evolution can strip away the in-depth flavor of fantastic ingredients provided without touch by nature centuries ago. He’s correct about that. It’s virtually impossible to recapture that but it’s possible to take away some of that evolution and gimmicky technology. Look at the vast, shimmering open kitchen (too open in Bleidorn’s opinion but that can’t be changed with the space’s design) of Birdsong and diners will see that this dining experience really is all about a pristine, transparent style of cooking that keeps modernism outside on Mission Street. 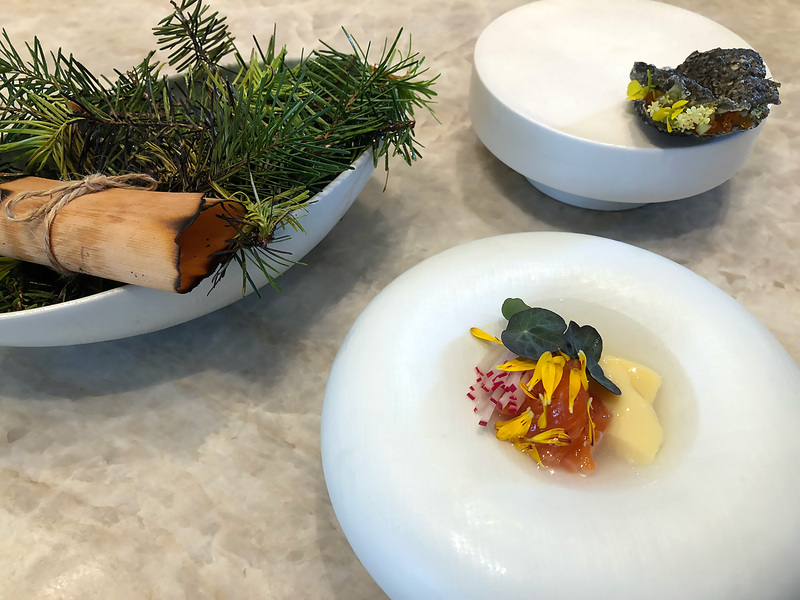 The Chef-Partner and his determined crew of chefs strive for a powerful tasting menu without relying on the tech-enhanced wow factor of foams, gels and basically anything that El Bulli or Nathan Myhrvold’s Modernist Cuisine would preach. 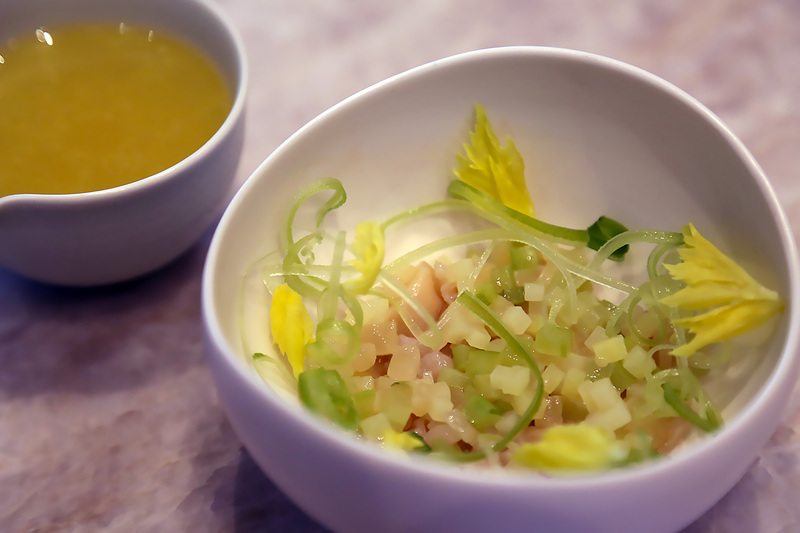 There is the same punch after punch across the tasting menu but in a more soft-spoken, birds chirping manner. 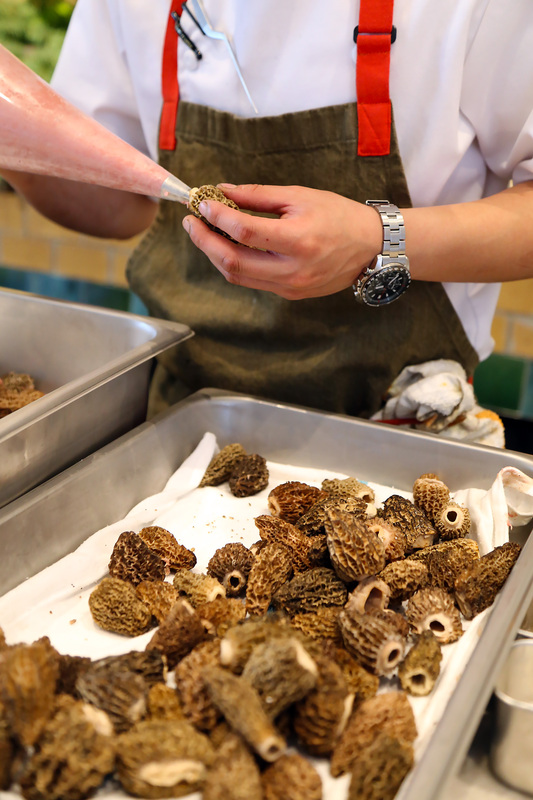 The next dish incorporates a Pacific Northwest staple, morel mushrooms, and stuffs them with spring lamb, then teams the morels with a sauce made of alliums and charcoal that is partially “ancient” campfire and partially Soul Cycle. Bleidorn’s final savory course in the preview menu centers on wild boar two-ways. One comes with grilled brassicas, grains, dried fruit and cultured broth. The other is BBQ-inspired with elderberries (another very Pacific Northwest ingredient), ramps and pine needle. 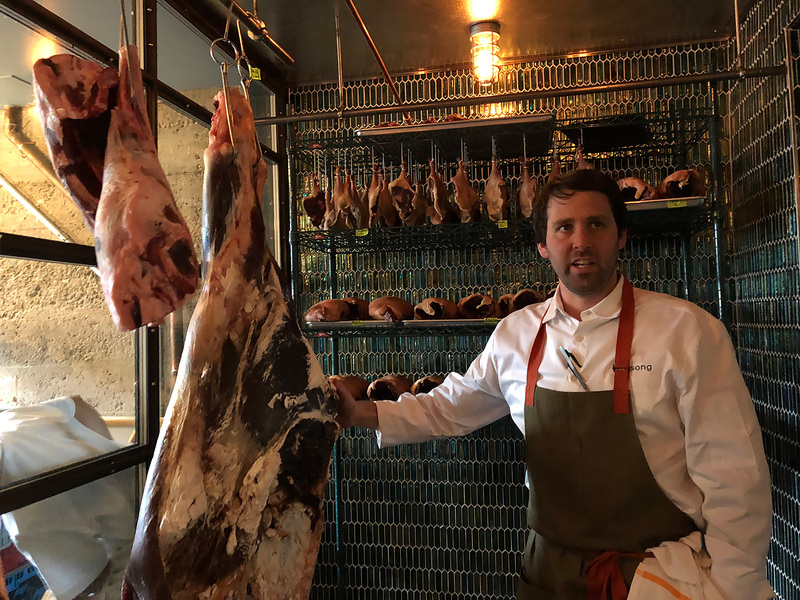 As much as we’ve harped on the streams and oceans influencing Birdsong — if you just looked at the downstairs meat locker next to the restaurant’s two below ground private dining rooms, you would think that this is a carnivore’s paradise à la Alfred’s or House of Prime Rib. 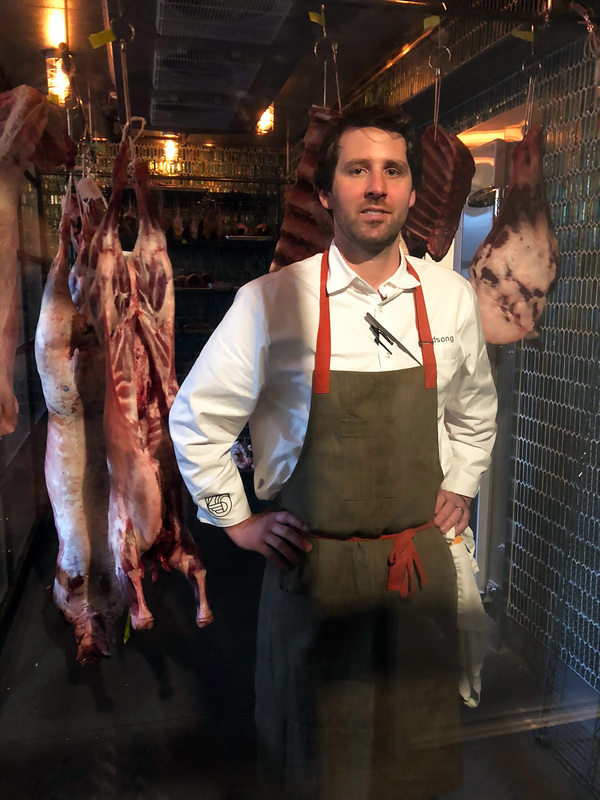 Bleidorn is fanatical about sourcing whole, grass-fed animals and actually prefers older, leaner ones — the opposite of most chefs. He could talk all day about the buffalo, lamb, mutton and duck hanging in the chilly room. It’s a fascinating philosophy for a meat program and equally interesting to look at. Let’s just say you know a restaurant cares about its glassed-in meat room when there are custom teal tiles in it. Dessert presently is caramelized bread custard with jasmine and toasted milk. Make sure to keep an eye on this finale and the desserts in the future at Birdsong because Bleidorn wasn’t just a sous chef star on the savory side. Indeed, after graduating from Johnson and Whales, the esteemed culinary institution in Rhode Island, he spent five years as a sous chef at Nine-Ten in La Jolla (a rare example of a great restaurant in a seaside resort in a touristy town) and served as a chef de partie for the vaunted Alinea in Chicago. But then from 2010-2013, Bleidorn was the pastry chef for Corey Lee at Benu. 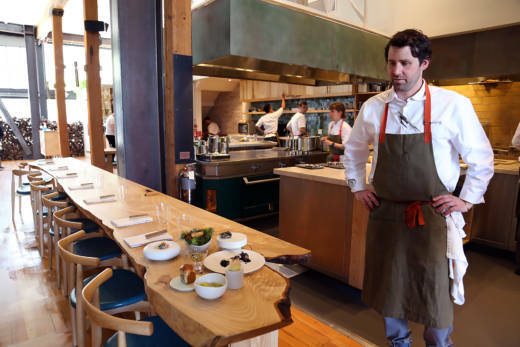 Afterwards, he swapped pastries for savory again as Atelier Crenn’s Chef de Cuisine and then as a chef at Saison. It was at Benu where Bleidorn met Aarti Shetty, a UC Berkeley Haas School of Business graduate and former healthcare industry analyst who pulled a career 180 and shifted gears to become Director of Operations for Corey Lee’s restaurants (Benu, In Situ, Monsieur Benjamin). She is a Partner for Birdsong...and also Bleidorn’s life partner. The management team also includes Bianca Ishikawa (Gary Danko) as Service Manager and Freddy Foot (also from Gary Danko) as Head Sommelier. While the food definitely has a little-to-medium amount of the Pacific Northwest theme going on, the region’s voice is really emphasized by Foot’s beverage list. Oregon’s highly regarded Crux and Pelican breweries are part of the beers on tap. Several Willamette Valley, Oregon wineries (Stoller, J Christopher, etc…) and Columbia Valley, Washington labels (Januik, Gramercy) appear on the by-the-glass and bottle lists. Without question, this is the most Oregon-Washington wine friendly program in the city, but that’s also not saying much because there really isn’t any competition. Take this as a great opportunity to study a completely different terroir and style of wine than you’ll find in California. 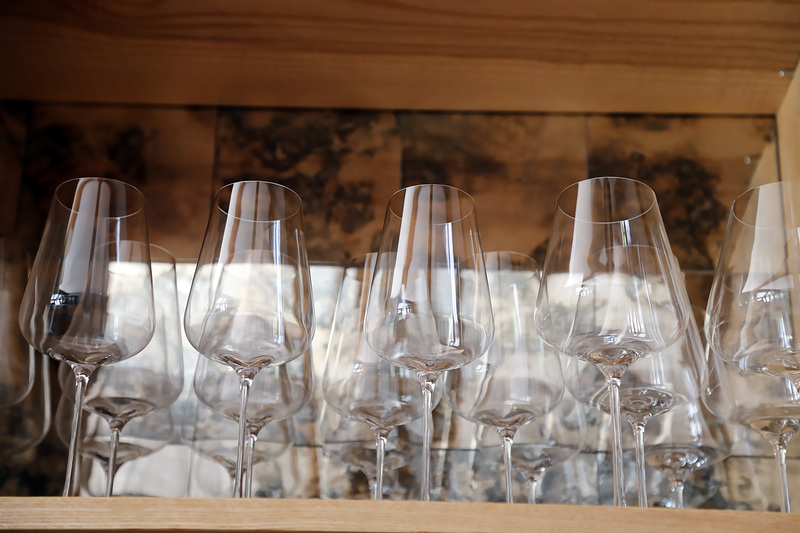 Oregon Pinot Noir and Chardonnay and Washington Cabernet Sauvignon, for example, are nothing like their counterparts in Sonoma and Napa respectively. Birdsong’s design by the Los Angeles and Washington D.C.-based SAINT firm is meant to feel homey and does indeed have the sought-after “hygge” (a snug, comforting feeling) feel of Scandinavia. However, it also is one heck of an elaborate, fairy tale living room and kitchen, just like how Bar Crenn is supposedly “a living room” but not like any real living room you’ve been to in San Francisco. 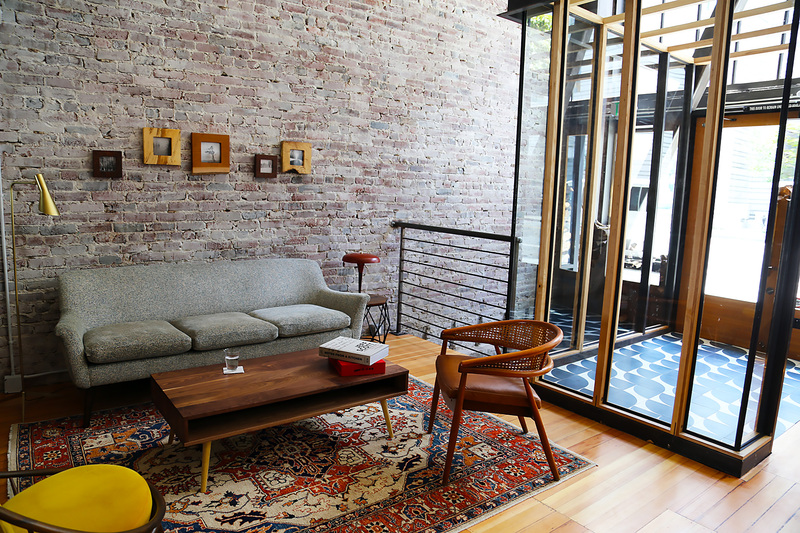 With tall ceilings and lots of windows, the space has a free, airy feel and no shortage of sunlight. A stack of wood by the front window allows additional natural light in but blocks out the “scenery” of Mission Street outside. As you’d expect in a restaurant that looks towards the forest, wood plays a huge part everywhere. Table tops are made of ash and floors come courtesy of Douglas firs. 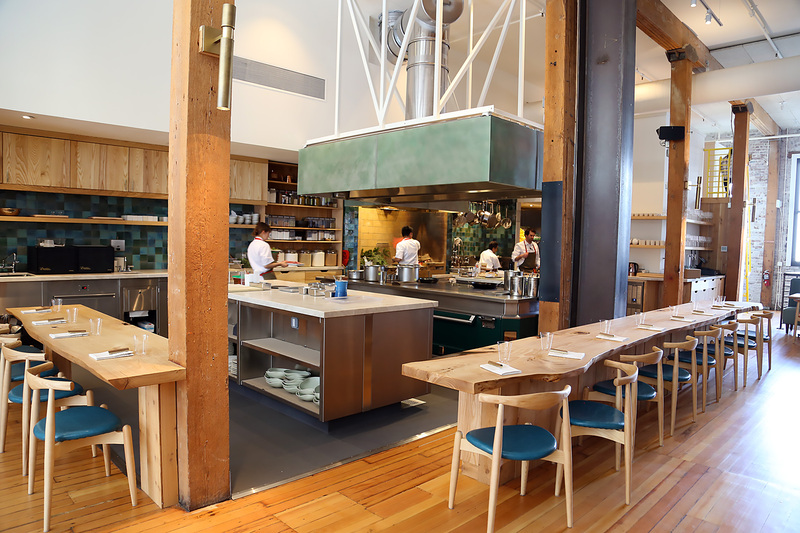 A 10-seat chef’s counter has jagged ends to its expansive wooden block and exposed bark that make the table look as if wind and rain shaped it. Not only is it the most visually intriguing table in the house, it’s also the best seat in the house, looking straight into the kitchen like you might at a sushi bar. 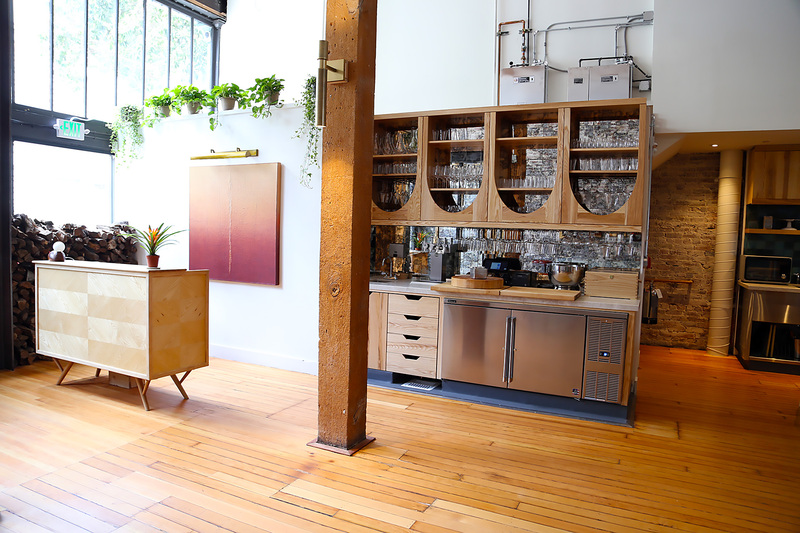 That open kitchen and its hearth are indeed the room’s focal point, designed by industry rock star Alec Bauer, who is also responsible for many of San Francisco’s most gorgeous kitchens like State Bird Provisions and Quince. 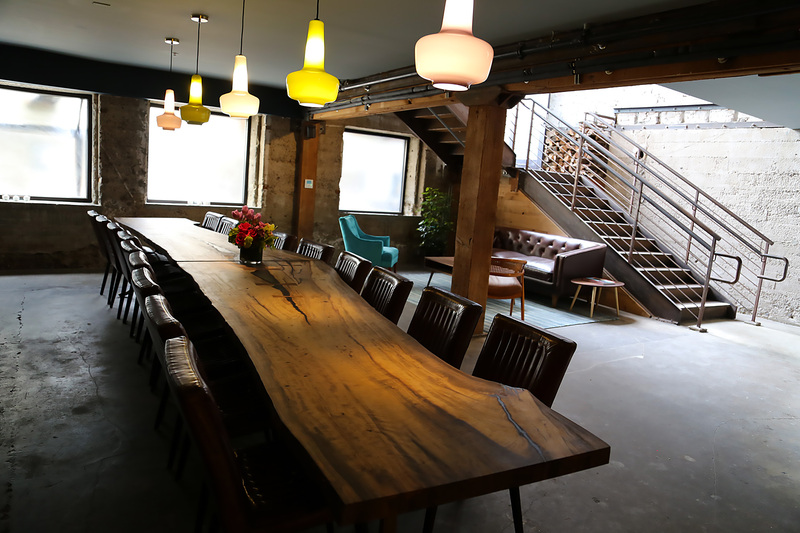 The other seating is along a brick-exposed wall with tables placed between two long, tufted turquoise couches and stylish leather seats. All in all, the dining room can seat 34 guests. 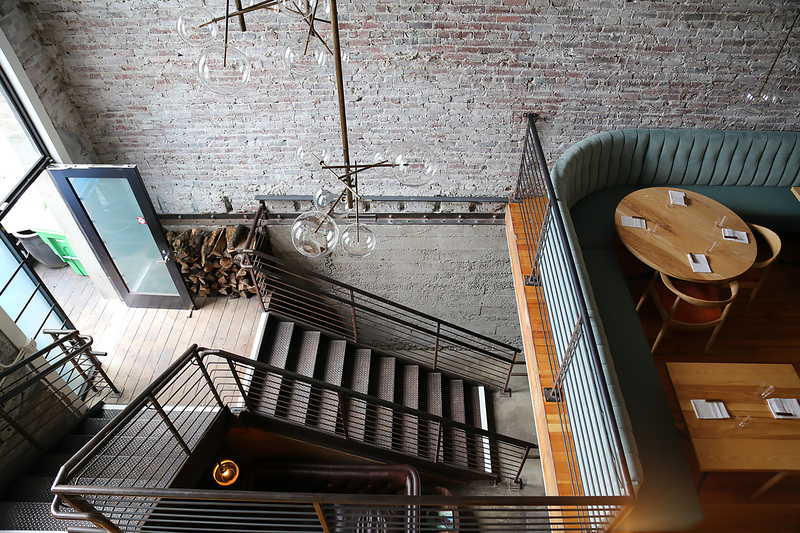 The street level space is book-ended by a pair of gorgeous design components — a salon-like sitting area by the telephone booth-evoking glass-enclosed entrance and a windy staircase to the private dining areas (and the meat) in the rear. Let’s also give a big shout out to the details in the design, like the handsome plateware that is the result of a collaboration between Bleidorn and a Korean ceramics maker who specializes in ancient pottery. The plates and glassware are seriously beautiful creations. Also, don’t miss the bubble lamps dangling from the ceiling that provide diners with limited lighting and elevate the romance factor significantly. Finally, let’s talk about “the tempo” in this song. Things are indeed fast and furious in this neighborhood and the whole topic of SoMa/Mid-Market restaurants is definitely the elephant in the room. 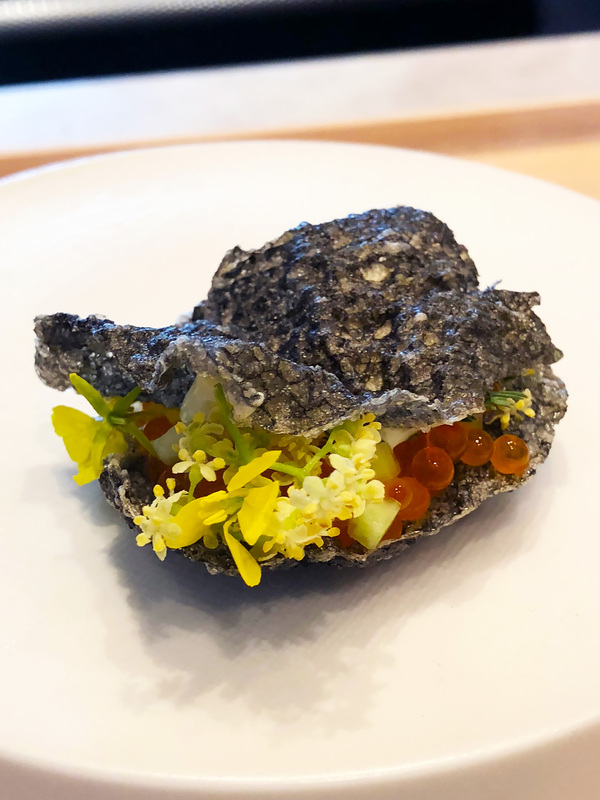 Birdsong’s predecessor in the space was AQ, a universally applauded casual yet high-end restaurant that closed unexpectedly at the beginning of 2017. AQ was a pretty profound concept, changing its menu and décor in tune with the changing seasons quarterly. 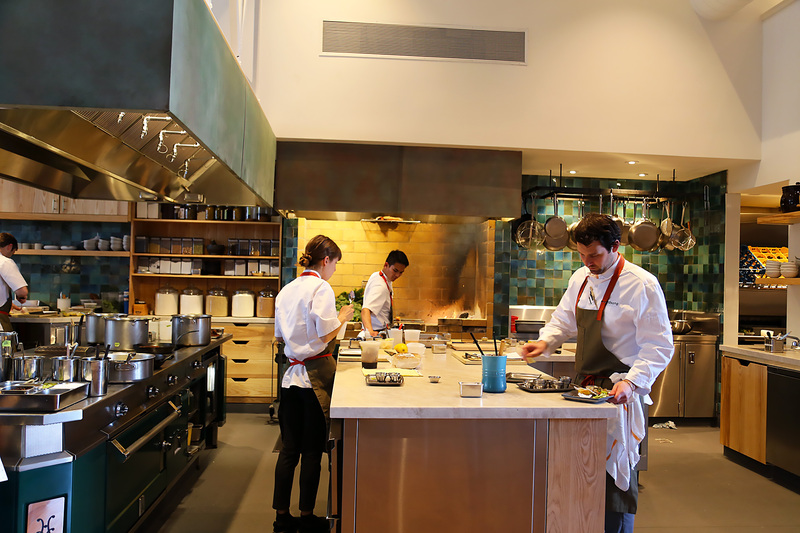 It really took “seasonal cooking” more seriously than practically any other restaurant in the country. Seasons were a literal theme. It worked in the early years and was a sign that things were changing in a neighborhood better known for homeless and drugs. If you spend much time in San Francisco, you’re aware how clearly that latter duo hasn’t changed much, even if politicians want you to think they have. Less than two years ago, AQ’s owners had three restaurants in this area (Fenix was two doors away from AQ and Bon Marché was in the Twitter Building). All three closed despite positive critical responses and general public reviews. Other promising restaurants like Oro, Volta and Cadence (this writer liked it, at least) closed shortly after opening during the same 2015-2016 time frame. AQ pointed to rising costs and customers unwilling to pay them as the reason the restaurant closed. It’s hard to imagine the neighborhood didn’t play a part in at least some, if not all of these closures. Even former Mayor Willie Brown wrote about how a homeless person harassed him outside AQ prior to a dinner there. But, alas, times change. The building boom in this area is hard not to notice. Birdsong has some great daytime next door neighbors with The Board (sandwiches/breakfast) and Saint Frank Coffee. Things are looking up in the neighborhood and Birdsong’s arrival will hopefully continue this new trend of optimism. You can hear the birds chirping on Mission Street.